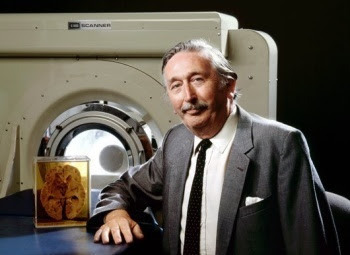 The first CT Scan was performed at Atkinson Morley Hospital in Wimbledon, London, in 1975. Godfrey Hounsfield was born in Sutton-on-Trent, Nottinghamshire, England. He perfected the Computed Axial Tomography scanner, CAT scan for short. He worked for EMI and became interested in computers. In 1958, he helped design the first commercially available all-transistor computer made in Great Britain, the EMIDEC 1100. With the success of the Beatles EMI had money to invest and asked Hounsfield to come up with a new area of research. He came up with the idea that one could determine what was inside a box by taking X-ray readings at all angles around the object. Godfrey thought he could use a computer to take images from X-rays at various angles and create a 3d image of the object. Hounsfield started with a prototype head scanner. He experimented on a preserved brain and the results were encouraging. He then used it on a cow brain from a butcher shop, eventually Godfrey scanned his own brain. The medical world, and EMI, were now excited at the potential of this new technology. 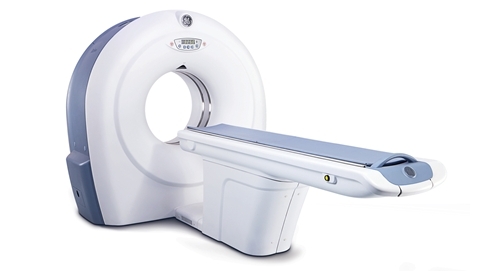 On 1 October 1971, CT scanning was used on a patient with a cerebral cyst. In 1975, Hounsfield built a whole-body scanner. 1979. Hounsfield and Cormack received the Nobel Prize in Physiology or Medicine. 1976. He was appointed Commander of the British Empire, CBE. 1981. Knighted becoming Sir Godfrey Hounsfield.